I have spent the last few weeks updating the website with new pictures and changed the look of it a little bit to showcase the images better. At the same time I have ruthlessly filtered out some of the weaker images giving the whole thing a fresher punchier feel. I have now re-configured the purchase system by linking each image to options with "google checkout" to allow use of credit cards. Print and mount options are now offered on a varied basis from A4 size prints in mounts to full "wall art" options at sizes up to 900mm x 600mm. The "Prints" page has been updated to reflect this. There is now a mix of scanned transparency film images and those captured digitally on RAW files, although the latter now predominate, these are set out in ten galleries with up to twenty images in each gallery. I am also offering other photographic services which have been set out on a new "Services" page. I recently had the opportunity to visit Australia on business and was able to take a day or two out to enjoy the culture, the food, the wine and the scenery. I took my camera and was able to get some reasonable shots of Sydney, Melbourne and the coast along the Great Ocean Road. A visit to the Blue Mountains north of Sydney proved difficult from a picture taking perspective as the weather was bad and a complete "white out" greeted me at the key observation points. Nonetheless in the short time available I managed to get a few decent images. 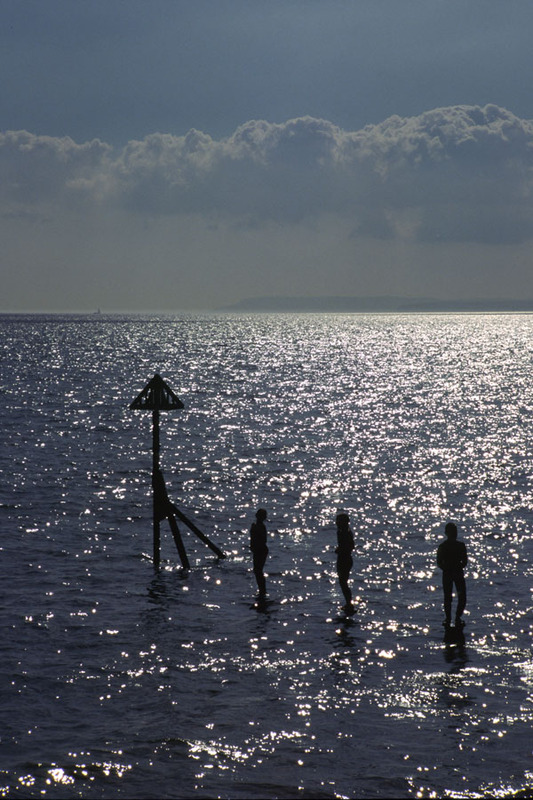 Bracklesham Bay, East Sussex - mid afternoon in high summer looking across The Solent. The headland in the background is the Isle of Wight. 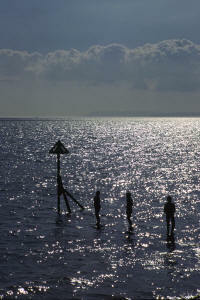 The tide is in and covers the timber groins on the beach - three youngsters are swimming and playing in the water. Every now and then one of them clambers up on to the top of the timber posts supporting the groin just visible at water level. Composition - triangular warning post placed near bottom left third point with the timber posts providing a semi diagonal lead in line. The horizon is placed along the top third line. The sun is kept out of the scene to the right. Exposure - this is a contre jour shot (against the light) so for a silhouette effect a spot meter reading was taken from the highlights in the water with the aperture set at f11 for good depth of field through the image. The shutter speed was around 1/500 second and this was selected with the camera set to manual exposure. All three boys decide to compete with each other and clamber on to the posts in line - the beach is crowded but fortunately there are no other swimmers to spoil the shot. The "decisive moment" - recompose and press the shutter, get slide developed, scan in to computer at very high resolution (100 Mb Tiff file), tweak contrast in photoshop and print full bleed on A3. I'm on the Charles Bridge - its teeming with tourists, its mid afternoon and the sun is still too high and in the wrong direction even for a record shot of the castle. A hopeless situation for any kind of photography! I'll get up at sunrise tomorrow and get some shots with no one around - I decide to take advantage of one of the bars in the old town square and do some people watching. Its just before seven o'clock on Saturday morning and the sun is coming up behind the eastern tower of the Charles Bridge, the sky is cloudless, the air is crisp and fresh and there, on the centre of the bridge, is a line of photographers, obviously on a photo holiday from the UK, with tripods and cameras at the ready! I'll just have to possess my soul in patience and wait until they have finished. I make my way towards the western tower and get some pictures of this end of the bridge with no-one about - the shadows are long as the sun rises and with a wide angle shot my own shadow intrudes - I decide to change the angle of view and zoom in slightly to lose the shadow. Its so beautiful and I also get some lovely images of the castle and the cathedral before returning to the centre of the bridge and trying some pictures of the eastern end as the sun rises further. I take a spot meter reading to the right of the sun to pick out the scene in silhouette both with and without some of the people now starting to appear. Later when the eastern tower opens I make the easy ascent to the top to get some high level views but by this time the bridge is becoming crowded again. "Just after six o'clock in the morning, the sun is coming up over my right shoulder, I'm at Marazion waiting for the sun to hit St. Michael's Mount, there is no one about yet, the air is fresh and still and the temperature just right, the tide is flowing and nearly at its peak - I'm rushing around trying to find the best viewpoint - I find three possibilities - the best where a pathway to the island slips beneath the the blue water gently ruffled by the slight breeze - pure bloody joy! I get my pictures - I wish I could do this for a real living - what a marvellous job to have - maybe one day when I'm a grown up." Cornwall - it really is the most beautiful county in England, and when the sun shines for a full week it provides an unlimited supply of photographic opportunities. So much so that I have extended the image galleries to two further areas to include pictures taken this August. From the north coast to Lands End to the Lizard and Bodmin Moor the views and opportunities were remarkable. The sea is just so incredibly blue. A week in the Scottish Highlands last May was reasonably successful with Glencoe being a favourite, the weather was very patchy with rain dominating some reasonable periods of sunshine. The Pembrokeshire coast is target for later this year. Carcassonne and possibly Seville or Barcelona or maybe Ljubliana are targets for next year. I am currently in the process of considering other new locations at home and abroad for photo trips and will also have a crack at some portrait work!! Poppyfields, can you find one when you want one? Tricky stuff unless you get lucky when driving around randomly (as you do). However on a business trip to Bristol late last Summer I drove past Faringdon in Oxfordshire and there on the side of a shallow hill was a field full, and I mean full, of poppies. It was quite spectacular, and with Faringdon's church visible at the top of the hill, it was certainly a photographic find. No camera though! Returning at the weekend with the necessary gear at about 7pm, I was greeted with almost ideal conditions with the weather stormy (alternating dark brooding clouds and blue sky and sunshine), and the flowers strongly backlit. "Graham Dean has been a photographer for over 20 years but still considers himself semi-professional. Personally I think he is doing himself a disservice. Not only did Graham design and build this impressive site himself; the images he has selected are both professionally presented, and well executed. Initially, the site was created as a vehicle to sell Graham's framed prints, but I think it moves beyond a simple sales tool. Portfolios include Cotswolds, Eastern England, Central England and Ireland as well as Jordan and Israel. The images range from windmills to mudflats - all presented on an effective grey background. The site has a news page where Graham lists trips to come: Seville, Warsaw, Carcassonne - it's a hard life"
Thank you for your kind words Tracy they are much appreciated.